Just when you think you've bought all the kit you need, Belkin comes along and says you need a 'Power Console' as well! Apparently it's just the ticket for removing electrical noise from your power supply, allowing your precious hardware to do the best job possible. It looks the business, but just how essential is it? Well-designed equipment already incorporates filtering in its power supply to minimise the effects of mains noise and transient 'spikes' (high-voltage surges of short duration). Most power supplies used in CE equipment these days - an exception being the majority of amps and receivers - are of the 'switch-mode' variety. These will work across a wide range of AC power supply, and are thus fairly immune to slight swings in mains voltage (usually caused by demand on the electricity generating and distribution network). The quality of the mains supply will depend on where you live. Those residing in rural areas tend to be the worst off - supplies tend to be the least reliable here, and voltages can vary. If you're near a large industrial plant that uses a lot of electricity, your mains might not be as clean as it could be, either. If your mains supply is less than reliable, I would always recommend using a UPS (Uninterruptible Power Supply) for devices like PVRs and digital recorders as well as computers, anyway. In the event of a mains outage, a typical UPS (which is fairly inexpensive) should keep a PVR going for a while thereby increasing the chances of your recording being completed. But if you're serious about protecting your hardware, reducing cable clutter and (potentially) boosting performance, this Belkin demands attention. There's no doubt that the PF30 is beautifully built. A peek inside reveals some massive wound components (known as 'chokes') that will reject high-frequency mains interference. Also present are devices that absorb potentially-damaging 'spikes'. 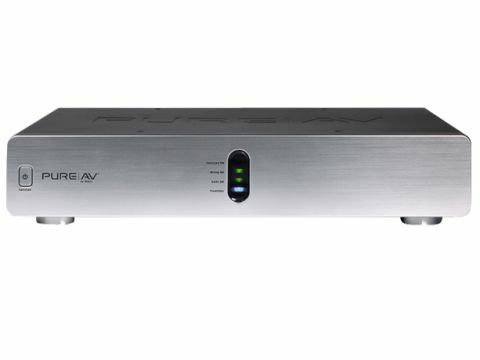 Outwardly, the PF30 is an elegant silver-fronted piece of equipment with five standard mains outlets - two video, two audio and one dedicated to 'HiCurrent' equipment like amplifiers and active subwoofers. The latter three are switched, the others being 'always on'. A nice touch is an eight-second delay which ensures that your amp is always turned on last and turned off first. As a result, there's less chance of experiencing any 'thud' that could damage your speakers. But it's not all about mains - also present on the rear panel are inputs and outputs for cable, satellite and terrestrial-aerial inputs and outputs. Catering for telecoms, meanwhile, are Ethernet and telephone-line connectors. All benefit from simple transient suppressors. Protection of different kinds are provided by a ten-amp mains circuit-breaker, and over-voltage protection (here, power is automatically removed from the connected equipment if your mains voltage is at an unsafe level). On the front panel is a series of LEDs. The first indicates that the switched outlets are active (they're turned on or off by a simple button). The second and third, meanwhile, assure you that your mains is correctly wired. A 'wiring OK' LED informs you that the live and neutral haven't been accidentally reversed by a cowboy electrical contractor - a companion 'Earth OK' indicator lights up if your mains supply is correctly-earthed. The final indicator indicates that Belkin's proprietary 'PureFilter' mains-filter circuitry is functioning properly. Supplied is a generous length (3m) of heavy-duty mains cable that runs directly to a convenient mains. Even more impressive is Belkin's confidence in its product. The PF30 is supplied with a lifetime 'connected equipment' warranty. If you're particularly unlucky and equipment to the value of up to £150,000 is damaged by a spike, surge or lightning strike then Belkin will repair or replace the items at its discretion. The downside is that you have to ship the damaged equipment to Belkin at your expense, although you'll be refunded in the event of a successful claim - a primary condition of which, of course, is that your mains installation is up to scratch. There's plenty of anecdotal evidence from users online that the PF30 has improved the performance of connected kit and ironed out electrical anomalies in sound and vision. However, I couldn't notice any subjective improvement in performance even when using high-quality hi-fi equipment and Super Audio CDs. I made a point of auditioning during peak electricity-usage periods, and even arranged for someone to take the PF30 out of circuit without my knowledge so that I didn't know exactly when the PureFilter was working its magic. With CRT/LCD TVs and a Hitachi projector, the PF30 didn't seem to contribute any obvious improvement in picture quality whether with HD or SD sources. I then took an oscilloscope to the filtered output, and compared it to a 'direct' connection to the mains supply. Both looked as they should - identically-clean 50Hz sine waves. To be fair to Belkin, the sub-station that serves me is only a few score metres away. Those with different circumstances could well see and hear a benefit without reducing equipment reliability either. While I didn't experience any performance benefit from my own kit, I'm still persuaded that the PF30 will prove a worthwhile investment for other system owners. Plus, the comprehensive warranty that Belkin offers, makes it a great value insurance policy for a high-end system. In short: you'll probably not actually need a PF30, but my guess is you'll still want one. Weird huh?